Why injection? To avoid side effects or to have more of the medication absorbed by the body. 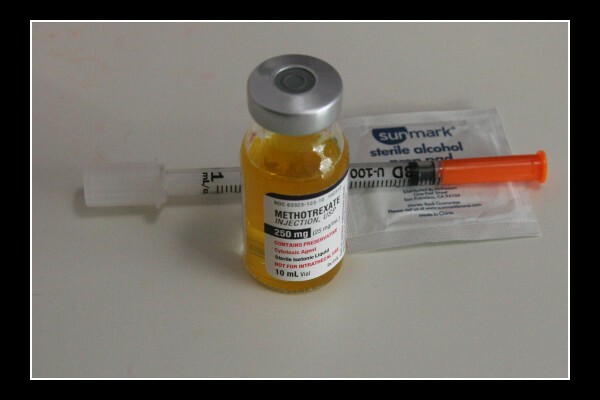 Vial of methotrexate, syringe, alcohol swab. Also access to your upper belly or outer thigh. withdraw the correct dose of your medication( mine is 25 mg or 1 ml so I withdraw up to the 1 ml mark). Tap out the air bubbles. Wipe skin if any leaks. There are no blood vessels in these particular areas that you need to be concerned with. Put your vial back in its box to protect the medicine from the light. This is awkward at first(new skill) but you will become expert after two or three administrations. Could I have permission to borrow your picture of your MTX injection and syringe for a university lecture in powerpoint on medications? I will credit you of course. I like that it looks like a photo someone took from home, rather than a sterile pharmaceutical product photo. Thank you! Karen, You may have permission to use my image of MTX and syringe for your university lecture.